In all likelihood, “you've reached more people in 72 hours than I will in a lifetime,” Ewelina Connolly told her daughter as they sat in teacher Jessica Marlin's classroom Wednesday. The 13-episode Netflix drama, which premiered March 31, is based on Jay Asher's young-adult novel about Hannah Baker, a high school student who kills herself and leaves 13 cassette tapes detailing the events – including sexual assault and bullying – that led to her death. It has attracted nationwide criticism for its depiction of teen suicide. The National Association of School Psychologists issued guidelines for educators and families about the series. It recommends vulnerable youth – especially those with any degree of suicidal ideation – not watch the show, and it encourages adults to engage teens in thoughtful conversations about the drama. Podzielinski, who watched the “powerful” show over spring break, selected teen suicide as her topic for a class assignment that involved writing a research paper and a creative writing component, she said. She was inspired to create a “13 Reasons Why Not” video for the creative writing piece after learning that teens in suburban Detroit shared their “reasons why not” over their school's loudspeakers. Creating the video was “very time consuming, but it was worth it,” Podzielinski said. Credit belongs to the freshmen, sophomores, juniors and seniors who agreed to participate, she said. They thanked various people – best friends and others – for helping them through daily struggles and heavier issues, including depression. Marlin, who had a classmate commit suicide in high school, said she shared the video on her Facebook page. 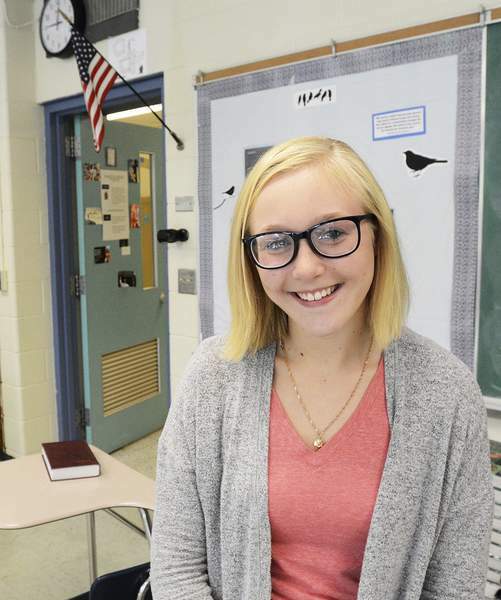 She is encouraged that high school students are promoting mental health awareness, she said. Marlin also played the video for her sophomores. Despite the video's length – it clocks in at 6 minutes 23 seconds – students “definitely were glued to it,” she said. Because upperclassmen participated, she said, younger students got to see those they look up to be vulnerable. Text in the video ad­dresses the importance of simple gestures, such as asking whether someone is OK, can have a significant impact on those vulnerable to suicide.